When Is Travel To Your Workplace Tax Deductible? ATO is targeting work-related travel expenses. 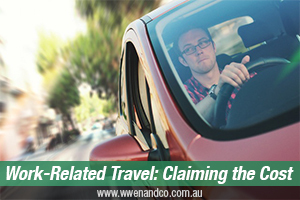 Work-related travel is a hot focus area of the ATO because taxpayers can often get their claims wrong . If your travel was partly private and partly for work, the general rule is that you can only claim for the part related to your work. What work-related travelling costs can I claim? Directly between two separate workplaces – for example, when you have a second job. From your normal workplace to an alternative workplace (for example, a client’s premises) while still on duty, and back to your normal workplace or directly home. If your home was a base of employment – that is, you started your work at home and travelled to a workplace to continue your work for the same employer – these rules are tricky so contact your accountant for more information. If you had changing places of employment – that is, you regularly worked at more than one site each day before returning home. From your home to an alternative workplace for work purposes, and then to your normal workplace or directly home. If you needed to carry bulky tools or equipment you used for work and couldn’t leave them at your workplace – for example, an extension ladder or a piece of your own machinery (note that the ATO is targeting this particular deduction). You do minor work-related tasks – for example, picking up the mail on the way to work or home. You have to drive between your home and your workplace more than once a day. You are on call – for example, you are on stand-by duty and your employer contacts you at home to come into work. You work outside normal business hours – for example, shift work or overtime. Your home was a place where you ran your own business and you travelled directly to a place of work where you worked for somebody else. A degree of flexibility exists for some work travel claims when the nature of the employment is deemed to be itinerant. If you do itinerant work (or have shifting places of work) you can claim the cost of driving between workplaces and your home. Note that you cannot count your home as a workplace unless you carry out itinerant work. Travel is a fundamental part of your work due to the very nature of your work, not just because it is convenient to you or your employer. You have a “web” of workplaces you travel to throughout the day. You continually travel from one worksite to another. Your home is a base of operations – if you start work at home and cannot complete it until you arrive at your work site. In case the above some factors give the impression of allowing for a very wide degree of flexibility; one recent Administrative Appeals Tribunal (AAT) decision adds to the factors to be considered if making claims for home-to-work travel in the case of itinerant work. A taxpayer claimed he was entitled to deductions for certain work-related travel expenses for meals and accommodation on the basis that he was employed in itinerant work. On the face of it, he seemed to fit the bill. During the year, the taxpayer undertook a number of employment arrangements and engaged in various roles. Each job was in a different location, each were short-term and seasonal in nature, and were all within the mining industry. Travel was not a fundamental part of the taxpayer’s work as it did not arise out of the nature of his employment with each employer. That is, the taxpayer was under no obligation with any employer to work at multiple sites. The taxpayer worked at only one workplace at any given time. Employment duties did not commence at the usual place of residence or at the various caravan parks where he parked his motorhome. When he finished the work at each workplace, he returned home for up to three weeks before commencing at another workplace. The taxpayer did not have a “web” of workplaces, and the location of each workplace was known to the taxpayer with a large degree of certainty. The taxpayer was not required to travel between different workplaces as part of his employment; he would travel between the caravan park where he parked his motorhome and the same workplace for the relevant period of each employment. None of his employers required him to travel from where he was staying to different workplaces. The taxpayer’s duties did not involve him travelling from workplace to workplace as is essential for itinerancy. He made a lifestyle choice to work in regional towns and live in his motorhome. He was not required to travel to these different locations in the course of his employment. Rather, he chose to travel from his home to undertake work in these locations. Over the past few years, the ATO has been targeting incorrectly claimed work-related travel expenses (for example, car expenses, flights and accommodation). This focus is expected to continue, and the ATO has warned that it will pay extra attention to people whose work-related deductions are higher than expected.